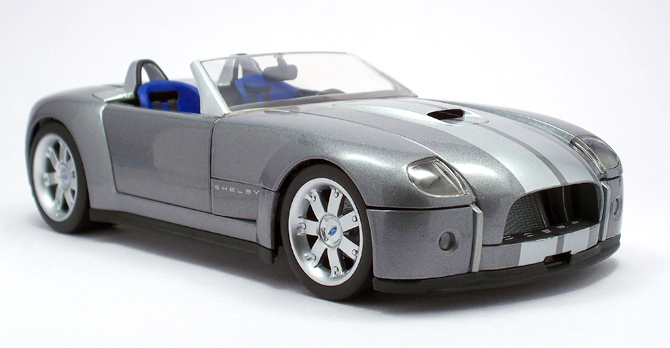 The Ford Shelby Cobra is a concept car unveiled at the 2004 North American International Auto Show by Ford Motor Company. 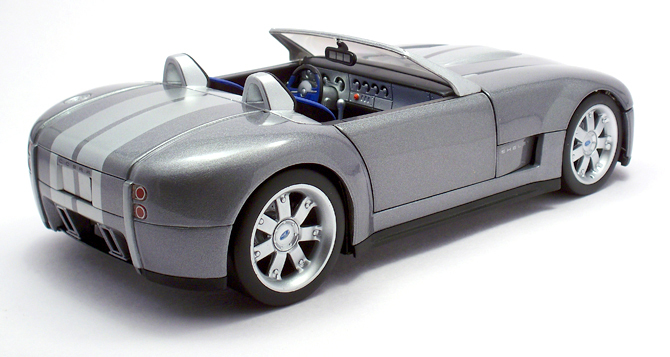 The concept roadster is based on the original Shelby Cobra that Carroll Shelby developed in 1964. 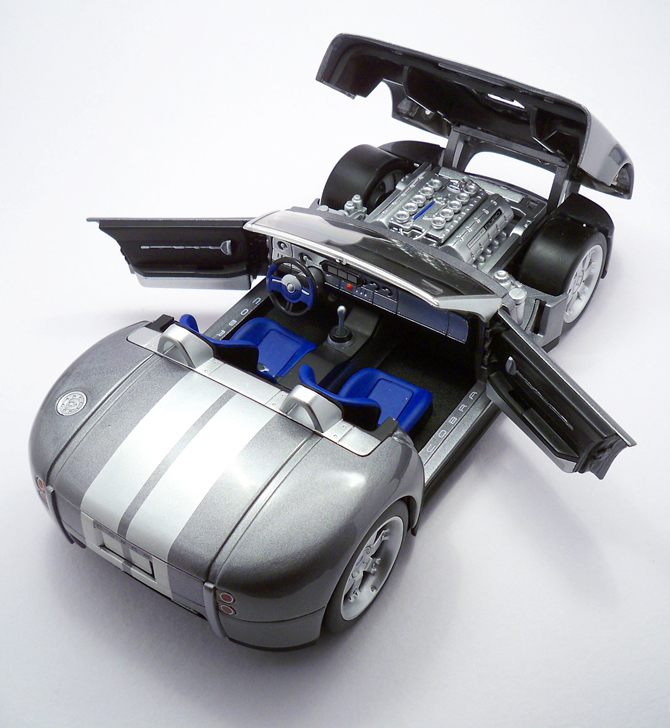 Ford’s Advanced Product Creation team designed and built the Shelby Cobra concept in five months. 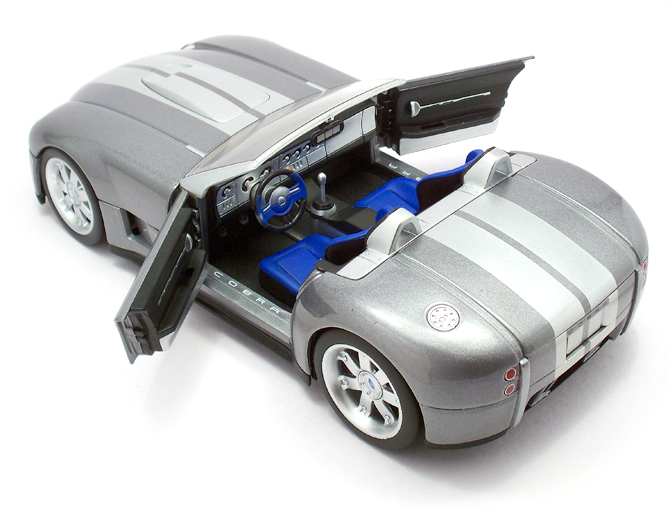 The project was led by Manfred Rumpel, like several other Ford vehicles the Shelby Cobra concept is a modern interpretation of older Ford models. Powered by an all-aluminum 6.4liters V10 engine producing 605hp and 679nm of torque making the engine one of the most powerful built by Ford. Ford claims it is capable of reaching 185mph though it is electronically limited to 100 mph. The six speed manual gearbox is placed in the rear allowing for the driver and passenger seats to be placed closer together adding to the compactness of the Cobra. Yes the car is sleek, short and looks every bit muscular as the real car and the color shade is also precise to the one showcased in the Auto Shows. The front end is highly dominated by the huge exposed radiator, which has mentionable detailing like deep recessed pattern, semi chromatic finish and inward placed COBRA badge in the bumper enhances the aesthetics. The front bonnet is huge and does the job of covering the massive engine very well; the small air intake is nice and enhances the muscular look and boosting modern attire. The headlamps are minimal and the setup works very well for a concept model. The fog lamp though nothing special but complements the headlamp quite efficiently. 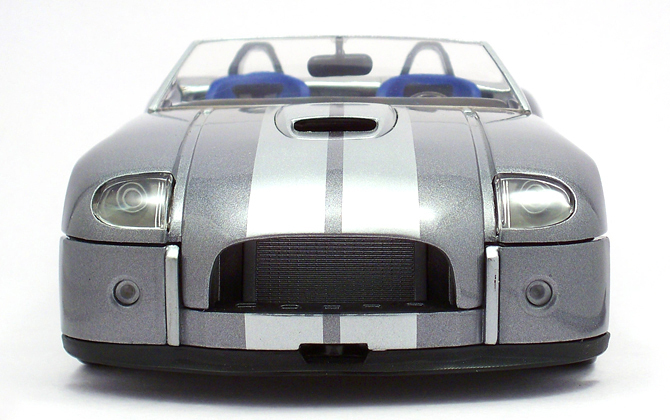 The low-slung design is effectively reproduced by HotWheels but ground clearance seems a bit on the higher side. The dimension is brilliant and the wheels deserve a special mentioning as they are very detailed just like the real car, even the logo in the center is carefully done and the dimension is also perfect. The slick tires and really FAT and their low profile design is nice, even the material is perfect for slicks. 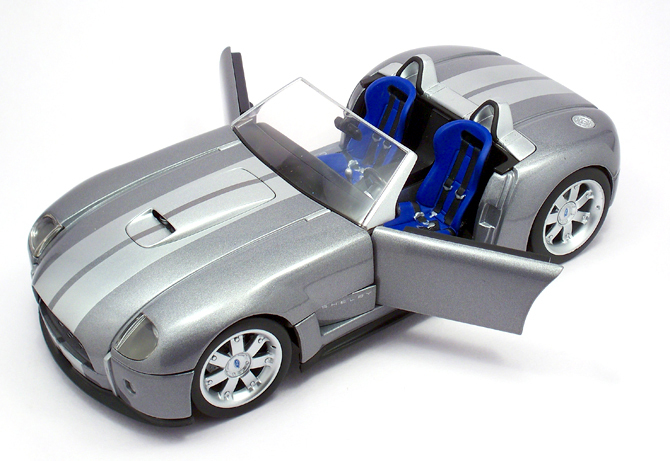 Being a concept roadster and cobra badging means the interiors are minimal and functional (towards performance) but when it comes to diecast models it is all the much details and materials used matter! 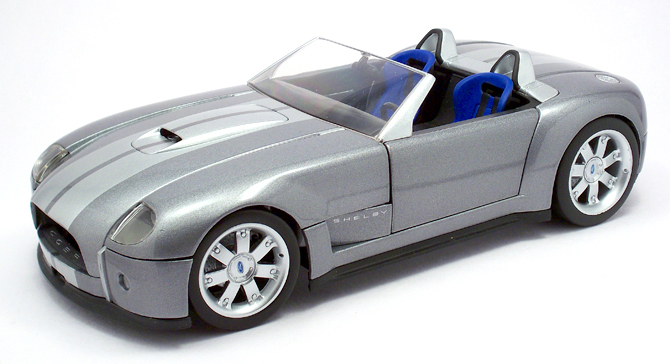 In my model car here the seats are absolutely gorgeous and that blue color just adds much required color tint to otherwise all gray car. Seat belts would have been great if they are separate pieces. 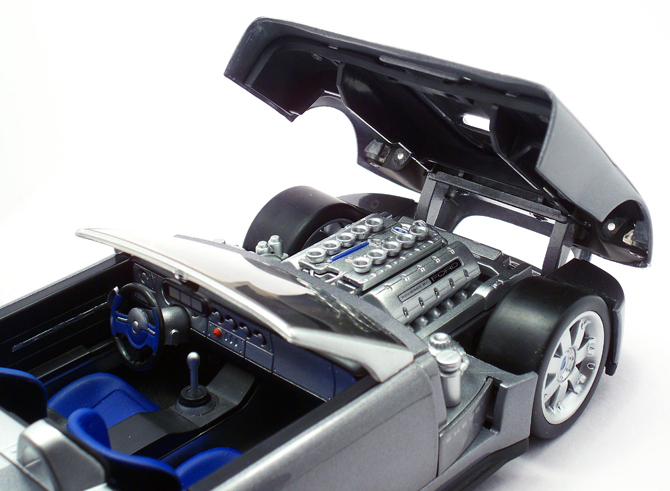 The instrument console is superb and very detailed, HotWheels even put an actual like speedo/tacho dial which show kind of dedication to model making. The doors open up wide and the hinge mechenisim is even better that what AUTOart models have, almost hidden (checkout the below pics) and works very smooth. The doorsill is an absolute masterpiece and the deep ‘cobra’ carving is something of superb precision. All the aluminum parts looks and feels like real, thanks to the special coating for parts like windshield mount and rear roll bars. The fuel cap is a nice touch, which sits on top of the rear panel and works the rears aesthetics. 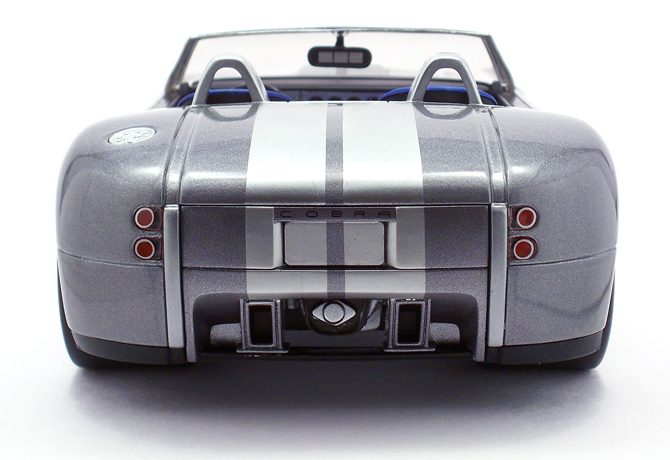 Unlike AUTOart’s model this car’s rear boot cover is not removable, but that’s not a big deal. The engine is massive and details are perfect! Size is matching the rest of the body, printed “POWERED BY FORD” text is sharp and smudge free (I guess that could be photo itching), Ford logo is also added to which is a very nice detail, which would have been missed by most diecasters. The rear though minimal shows enough aggression as the front to keep you glued to it. Two pair of rear lamps is a bit of boring in my view, as they are not translucent but opaque. The license plate carrying Ford logo is missing which is a big setback but the quality of the rear panels are of appreciable quality. 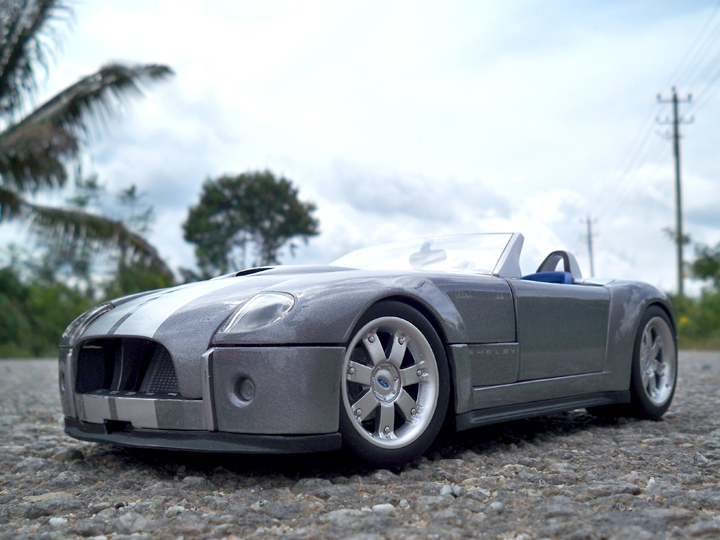 This is one of those high quality collection in my case and it is not made by AUTOart that the real catch. This being a import from US via 20North, which came with free shipping saving almost for at-least one more Maistos or Bburagos. The extra premium feel is due to a slight weight and smart body feel which only can be felt.